Kenneth Fox: I've been told by the Doctors that for someone in my position that suicide or employment are both signs of insanity. 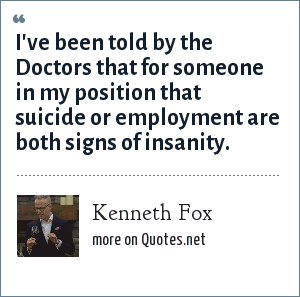 "Kenneth Fox Quotes." Quotes.net. STANDS4 LLC, 2019. Web. 24 Apr. 2019. <https://www.quotes.net/quote/73962>.